Jon Challinor scored for Stamford. Stamford were pipped 2-1 in a cracking Evo-Stik League game at unbeaten Division One South leaders Basford last night (November 20). Basford took an early lead through Liam Hearn, who hooked home the opener at the back post in the 12th minute after Stamford had failed to deal with a long throw. But by half-time the visitors had levelled through Jon Challinor with a superb first-time finish into the bottom corner after a header from Eliot Putman had laid the ball into his path. Both sides had chances to take the lead in the second half but the only goal came in the 77th minute from Basford’s James Reid, who won the ball in midfield and rifled home a fine strike. Basford’s lead at the top is now 13 points. Stamford are 10th. 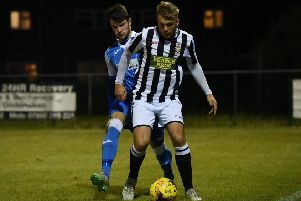 Peterborough Northern Star will hope a change of manager will lead to a change of fortunes when they visit Yaxley for a United Counties Premier Division match tonight(November 21). Holbeach United could jump from fifth to third with a positive result at Boston Town tomorrow when there’s also a first round Hinchingbrooke Cup tie between Bourne Town and Eastern Counties League side Ely City at the Abbey Lawns and a Cambs Invitation Cup quarter final between March Town and Cambridge United’s development side at the GER.